Luisa Gibson wins on a count-back! 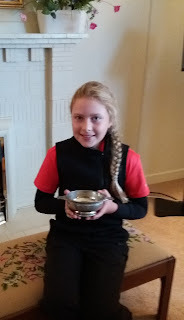 Playing in the Centenary Trophy stableford competition at West Kilbride today, two girls made the most of the calm, sunny conditions amassing 40 points, Luisa Gibson (Ardeer) taking the trophy on the better inward half from holder Claire McLaughlin (West Kilbride). Cristina McCracken (Troon Ladies) was 3rd on 31 points. 4 Pre-handicap Girls played 6 holes from forward tees, Melissa Graham (Barassie) scoring 35, runner-up Katie Ronnie (Barassie) on 36, closely followed by Connie Greig (Barassie) and Tammi Grady (Caldwell). Katie won the putting competition after a play-off involving all four girls.